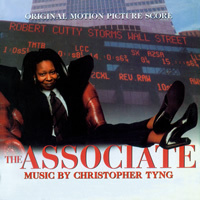 Presenting the premiere digital release of Christopher Tyng's soundtrack to the 1996 comedy THE ASSOCIATE starring Whoopi Goldberg, Dianne Weist and Eli Wallach. Investment banker Laurel Ayres (Goldberg)is a smart and single woman trying to make it up the Wall Street corporate ladder, until one day she finds out that she is passed over for a promotion because she is a woman. Unable to face the fact that her less smart and sexist male protege, Frank, has now become her boss, she quits and tries to start up her own company only to find out that the male dominated world of Wall Street is not interested in taking an African American woman seriously, and thus is forced to create a fictional white man (Robert S. Cutty) in order to be judged on her own merits.